As an Orlando local, I am often asked, “I have preschoolers. What is it like having preschoolers at Islands of Adventure?” My response is, “It is so much fun!” Preschoolers will love being at Islands of Adventure. Many of us fight the battle of taking two children to a theme park who are different ages and have different interests. To help make your visit to Islands of Adventure a bit easier, here is a list of the five best rides for preschoolers who are under 40 inches tall. Flight of the Hippoogriff: (Must be 36 inches tall to ride) When my family and I travel to Universal (which is almost weekly), this is the favorite for my boys (who are 3 and 4). This ride is a roller coaster located near Hogwarts. It seats two people and is fast, but doesn’t have a large drop like other roller coasters. You have a wonderful view of the Wizarding World of Harry Potter and kids love all the twists and turns. Pteranodon Flyers: (Must be between 36 inches and 50 inches) The fun thing about this ride is that adults can only ride if you have a child that fits within the height requirements. Located in the Jurassic Park area, Pteranodon Flyers is a suspension ride that makes you feel as if you are gliding thru the air. The Cat in the Hat: (No height requirement) This ride is fun for the whole family, especially if you have ever read the book or seen the movie. The Cat and the Hat ride brings the story to life. As you ride in a car that can fit two adults and one child, you will go though the pages of the story. Your kids enjoy seeing the characters. 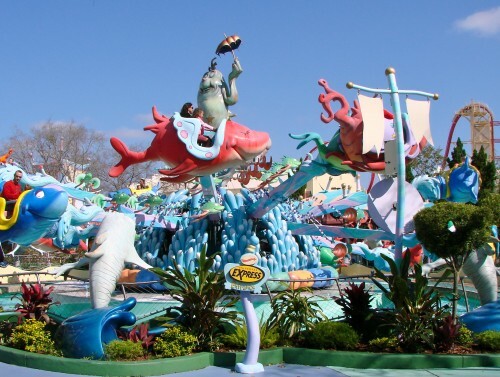 One Fish, Two Fish, Red Fish, Blue Fish: (No height requirement) One Fish, Two Fish, Red Fish, Blue Fish involves climbing aboard fish and taking a journey into the air. 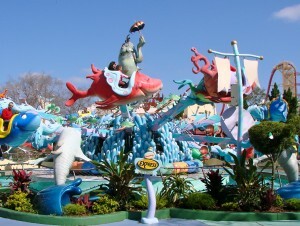 It is very similar to Dumbo as the fish move up and down. Storm Force Accelatron: (No height requirement) This ride can fit your entire family of 4 in one spinning car. This ride moves in a circular motion and you can spin your saucer around to go faster. We like to ride this as a family and spin the car as fast as we can….which is my boys’ favorite thing as well. So please don’t let the fact that you have preschoolers keep you away from Islands of Adventure! Take advantage of the rider swap stations (located on most rides) and maximize the things you can do together as a family. Kristi Gregory lives in Orlando with her husband and two boys. Who better to plan a trip to Universal than a local who visits Universal multiple times a week? Her clients enjoy insider tips, personalized itinerary planning, and attention to every detail of your trip. Call Kristi at (859) 229-4840 or email to start planning your next vacation.